One of the most common ways of connecting speakers to a receiver or amplifier is through the use of binding posts. Whether you’re using bare wire or banana plugs, these simple connection points will work with any 10-gauge speaker cable, allowing you to easily dictate the length of wire needed for your particular setup. Unscrew the caps covering each binding post until you expose the small hole through their centers. These caps are typically colored red and black, and represent positive and negative terminals, respectively. Twist the bare speaker wire to create a single strand. Kanto speaker wires come tinned, so this step isn’t needed. Insert each side into the exposed holes. 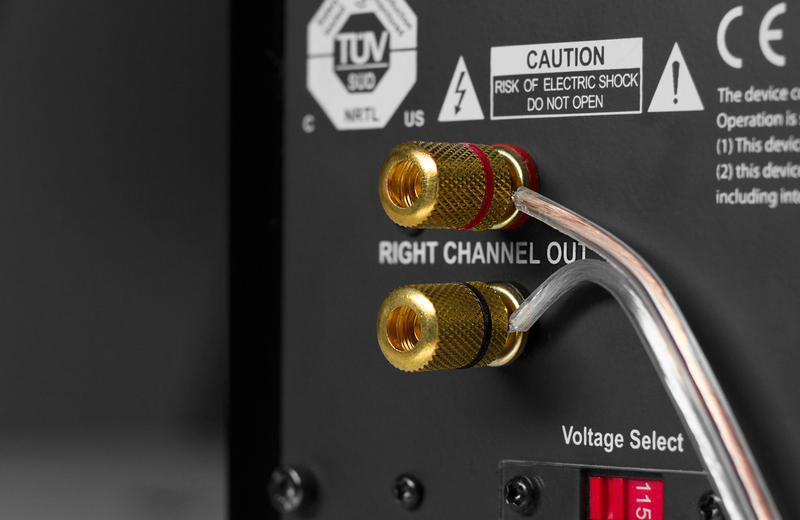 To ensure your speakers function properly, make sure that the wire leading to the positive (red) binding post is also connected to the positive terminal of your receiver or amplifier. This should also be the case for the negative (black) terminals. Most speaker wires will have distinguishing attributes, such as different colors or markings, to make this process easier. Tighten the cap to secure the wire in place. And you’re done! A quick, easy and scalable solution to setting up your audio system. Unscrew the base of the banana plug and insert the wire through the bottom. To make it easy to identify which wire is positive and which is negative, most banana plugs will have red or black markings. Red indicates positive, black indicates negative. Match your plugs and wires accordingly. Spread the wire over the tip of the plug. Try to avoid covering the threads while doing this, as it can prevent the plug from being screwed back together. Screw the top of the banana plug onto the base to lock the wire in place. Tug on the wire to ensure it is properly secured. Repeat these steps for both wires, making sure to use matching plugs on opposite ends.